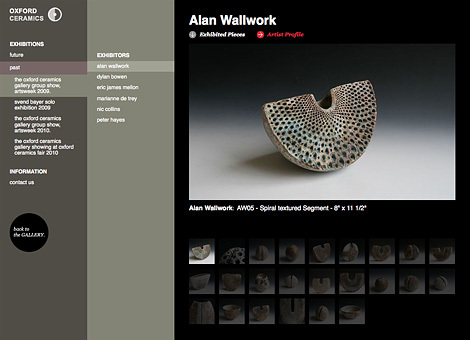 Oxford Ceramics exhibition « Iain Claridge Studio - Art Director / Digital Creative. Bristol, UK. 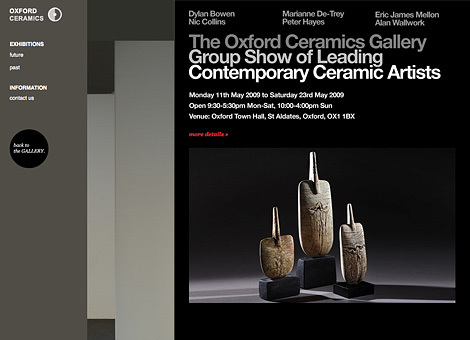 "a smart example of an efficient and established site"
Exhibition website for ceramics gallery, Oxford Ceramics. Produced whilst working for Netsight in the role of Senior Designer and Head of UX. 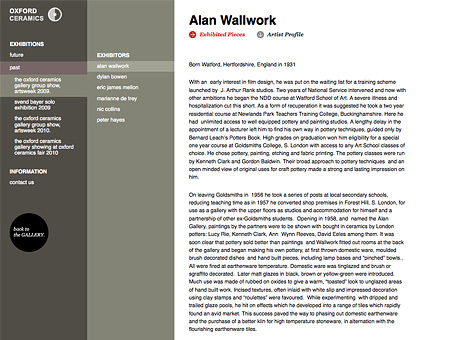 Featured as a 'selected website' in the online showcase of inspirational websites, siteInspire. This website and the content contained within it presents a body of work produced between 1999 - 2012. It is displayed here for archive purposes in it's original interface and is not representative of current work output. © 1999-2012 Iain Claridge or respective clients. All rights reserved.